End the frustration of time-wasting meetings by harnessing the power of well-managed sessions. 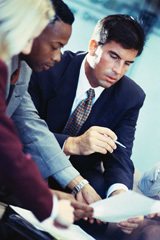 Deliver productive outcomes and strengthen relationships. Running effective meetings is a skill that most managers and teams need, but have not received training for. This highly interactive workshop is ideal for any person who is responsible for leading meetings, such as executives, managers, supervisors, team leaders, project managers, professional facilitators, trainers, and human resource staff. When do you really need meetings?